FAR’s health team recently wrapped up a year-long study on the cognitive and mental development of toddlers. The study, which focused on 700 children between nine and 36 months in the Berd Region of Tavush Province, showed that a significant portion—28 percent—struggle with issues related to communication, problem solving, socialization, and both gross and fine motor skills. 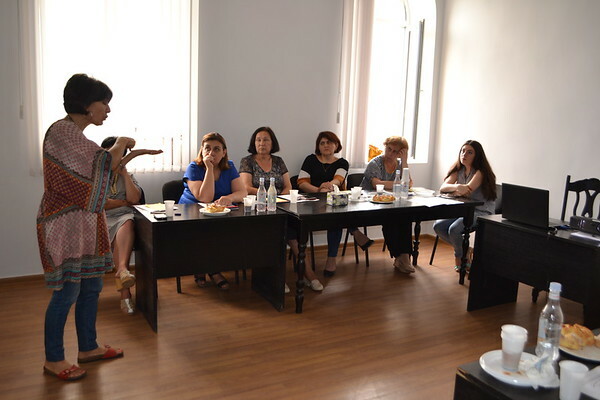 To also address some of the issues revealed, and to ensure parents in Berd learn to be more attentive to their babies’ growth, FAR organized a Training of Trainers (ToT) workshop for the region’s doctors and nurses. Dr. Susanna Ayvazyan from Berd Medical Center found the training to be beneficial. “The training focused on teaching us how to identify the problems we see in children as soon as possible. We also learned how to better coordinate our steps toward solving the problems that we may identify in any kid,” she said. “For healthcare practitioners, we try to enrich their knowledge to ensure they will now lead parents in the right direction from the first days of their child’s birth,” Hambardzum added. The study used the “Ages and Stages” survey developed with the help of local experts from the Arabkir and Arbes medical centers, and was conducted as part of FAR’s Breaking the Cycle of Poverty Program (BCPP). FAR will use the results of this study to design upcoming projects geared toward children’s mental health and cognitive development within Armenia. Breaking the Cycle of Poverty Program (BCPP) is a multidimensional FAR project addressing child poverty in the Berd Region of Tavush Province, and is sponsored by the Edward and Helen Mardigian Foundation.